More than 100 people, including school officials and community members, turned out for a forum on harassment hosted by the Kittery School Department Monday night. KITTERY, Maine — A turnout of more than 100 students, parents and school administrators at a Monday night forum is being called a great start to a discussion on how the Kittery School District can foster a school culture free of bias and harassment. 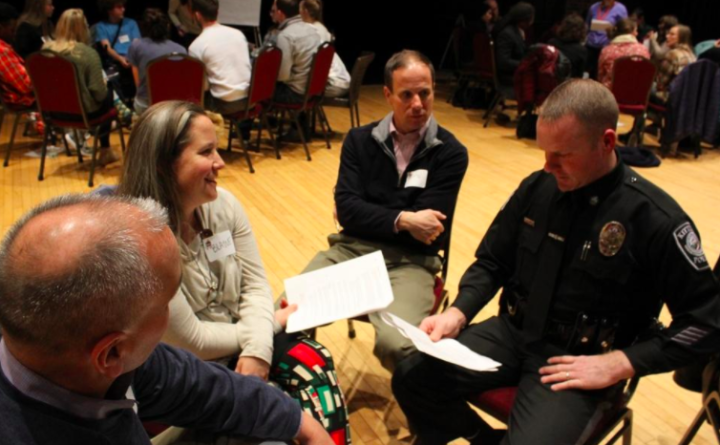 The forum was facilitated New Hampshire Listens, a civic engagement program through the University of New Hampshire’s Carsey School of Public Policy. Attendees at the town community center were asked how students, parents, community members and staff could work together to create a safe, respectful, healthy culture in the school and in the community at large. Superintendent Eric Waddell said the outpouring from the community interested in advancing the discussion was a testament to how dedicated residents were in improving their school culture. Attendees broke into smaller groups and raised issues such as making efforts to increase diversity among the staff, ensuring the school curriculum adequately addresses cultural and historical issues like America’s negative racial history and looking for ways to celebrate individuals’ diversity. Resident Mary Stevens pointed to survey data that reports only 30 percent of Traip Academy students believe faculty addressed “conflict, negative language and bullying in a positive way to help students,” and said high school students often internalize the mistreatment they endure and do not report it to an adult. Traip senior class president Sommer Huntress participated in a group discussion with fellow students. She said students needed to work toward taking their online disputes in social media into a space where they could feel comfortable talking about the issues in person. Waddell said the forum was a first step in the schools’ efforts to engage the community to help foster a harassment- and bias-free school culture and community, and attendees were appreciative to have an open and respectful space to listen to one another.